Seven months ago, I was up in Big Bear for our youth group’s annual Winter Camp. I woke up at around six and headed down to the main lodge, hoping to curl up on the couch with a bowl of cereal and warm up next to the fireplace. With a bowl of Cap’n Crunch in one hand and a book of matches in the other, I headed over to the fireplace… and was greeted with a cushionless couch. Apparently, some of the boys had taken them in the night to build forts, shields, and a giant “mega-bed.” They also spent at least an hour playing the “lava” game. Epic, I know, but not what I was hoping to find at 6:12 am. You see, for those of you who own couches (most of my post-college audience, I assume), you know that I didn’t find just a cushionless couch. Concealed for what must’ve been decades beneath those tacky plaid cushions was a hodgepodge of delightful treats. Where should I start? There was the candy: three and a half gummy worms, about two dozen nerds which had probably started off orange but had since faded to an unappetizingly chalky white, about three-eighths of a jawbreaker, and what I sure hope was the remnants of a Milky Way bar. There was also what I assume started off as a single Oreo, a six-sided die, a monopoly house, an almost-empty travel-sized tube of toothpaste and some used dental floss, a “MASH” scorecard (spoiler alert: they all died alone), a used iTunes gift card, and a mysterious sticky substance that was purple in color and salty in taste. It wasn’t all bad, though. I did manage to find one dime, three nickels, six pennies, and an unidentified silver coin bearing the image of an elderly woman among the other remains. Jesus once compared the Pharisees and Sadducees to “white-washed sepulchers” (Matthew 23:27). They worked hard to look good on the outside, while on the inside they were dead. They were lost, confused, and filled with sin. Christians love, love, love to put on a show. We love to look like we have it all together. 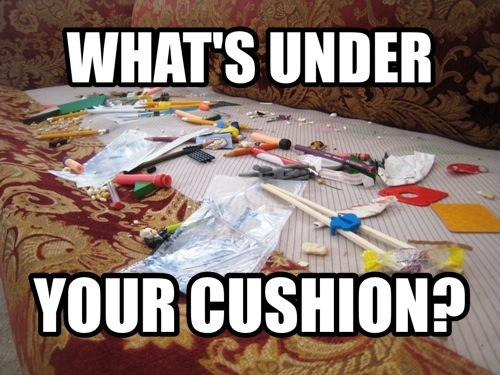 But ask yourself today, what’s under your cushion? Is everything on the inside nice and clean, presentable for the King of kings? Or do you have a mess on your hands? There’s nothing wrong with getting a little gunk stuck in there every now and then. Just don’t try to hide it. Jesus can’t clean up your couch if you won’t let Him see what’s under the cushions. Deal with it now. Let God clean up the mess so you can walk perfectly before Him today. CHALLENGE: And hey, just for fun, email me pictures of your filthy couches. I need the encouragement to know I’m not the only one! My newest book, UNFAIR ADVANTAGE, is available on Amazon. Best book you’ll read this summer. It’ll change your life. Fortunately for us, God answers these questions repeatedly throughout the bible. As I’ve mentioned before, there are over 170 distinct passages in the bible that address God’s attitude towards healing. 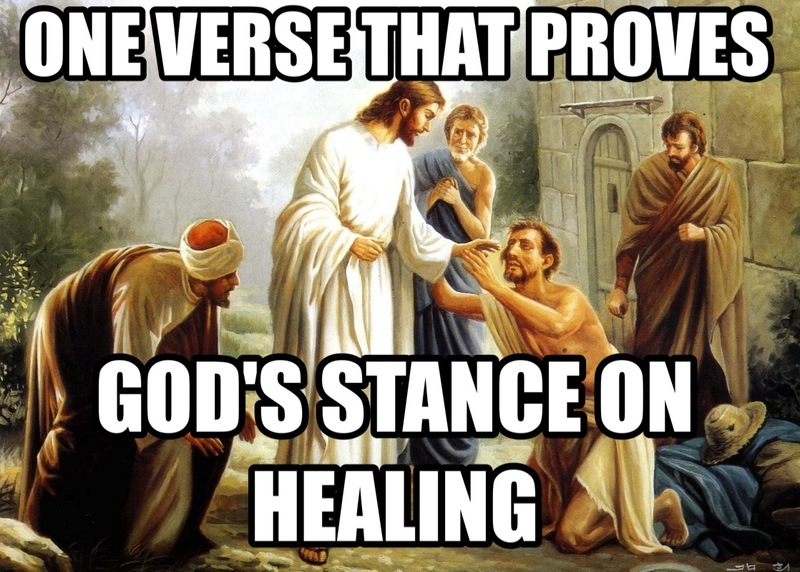 But there is a single verse that reveals to us God’s stance on healing. There are several lessons we can glean from this one scripture. We are told that during His ministry, Jesus Christ went about “doing good.” But in what ways did He do good? According to Luke, by healing. We see throughout the bible that Jesus is committed to doing good. The seventh chapter of Matthew’s gospel tells us that God always gives good things to those who ask (Matthew 7:11). Furthermore, James 1:17 says that good things always come from God, and that there isn’t even an inkling that this will ever change. Now it may seem obvious that healing is good, but there are many Christians who aren’t so sure. Being confident that healing is always good, we can rest assured knowing that the biblical promises of God’s unfathomable goodness includes physical healing. Again, you might take this for granted, but much of the Christian community thinks sickness comes from God. Take Job, for instance. The common understanding of Job is that God caused terrible things to happen in Job’s life to test his faithfulness. But according to Job 2:7, it was Satan (not God) who smote Job with painful boils. Far from “God giving and taking away,” the text makes it clear that Satan caused this infirmity. From the mouth of Jesus Himself, anything that steals, kills, or destroys comes from Satan, and not God. Every sickness known to man fits that description, and to attribute any ailment, disease, or injury to God is to reject the biblical text. God only has good things for His kids, and offers life in the place of sickness, pain, and death. 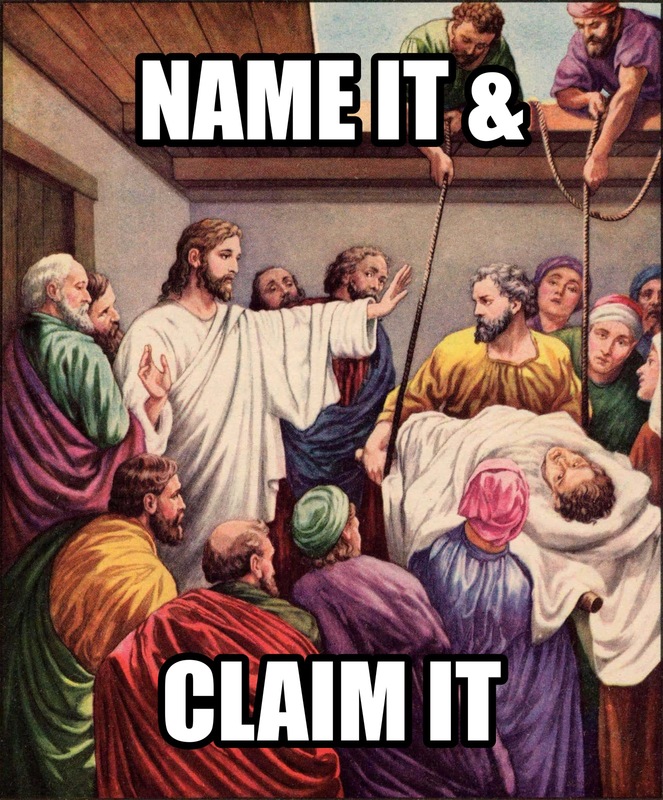 According to Acts 10:38, Jesus heals ALL. That includes you. We see this confirmed over and over and over again throughout the bible. Luke 9:11 tells us that Jesus healed all who had need of physical healing; Matthew 8:16 says that Jesus healed all who were sick; and John 6:37 says that Jesus doesn’t turn anyone away. In fact, there isn’t a single biblical example of God refusing to heal someone in need, and the only time in the entire bible we see Jesus not heal is when He was prevented by the unbelief of those in need. A lack of faith in God’s power and willingness to heal is the only thing that has ever prevented Him from healing the sick. When I talk to people who have questions about healing, I often bring them to this verse. After reading through it, I usually ask them a series of obvious questions. Then I ask them a few more questions. “Is God with you, too?” Isaiah 41:10 and Matthew 28:20 say He is. And both Hebrews 13:5 and John 14:16 say He will always be with us and will never leave us nor forsake us. “Have you been anointed with the Holy Spirit and with power?” Luke 24:49 answer that question with a definitive and resounding YES. 2 Corinthians 1:21-22 attests to this truth by saying that we have been anointed by God with the Holy Spirit. And Ephesians 3:20 says that the infinite power of God dwells in us. His people. No bible-believing Christian can deny that physical healing is good, that sickness comes from the enemy, and that God is ever willing to heal anyone who comes to Him in sincere faith. But more than that, we see that this miraculous healing power, this authority, this goodness has been placed in us by none other than God Himself. So let’s live in obedience to the commands of Jesus, and go out into a world of lost and desperate sinners, preaching the gospel and healing the sick (Matthew 10:8; Mark 16:18). This is good in the sight of the Lord.